The weather forcast indicated gail in the afternoon, but we did not experiance any more than 15-17 knots of wind before we fixed our line top the quayside in Cavtat. For a few hours we had calm weather and our young crew asked us to park the boat such as they could have a swim. We hooked on the leider and soon after both of them were swimming aft of the boat to cool down. The sea temperature were about 25 degr C which I understood were very nice. 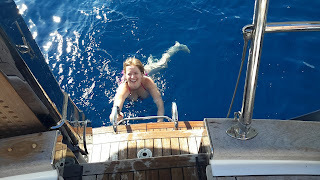 We arrived Cavtat 18:00 and made our lines with the aft toward the quay using our own anchor in the front. 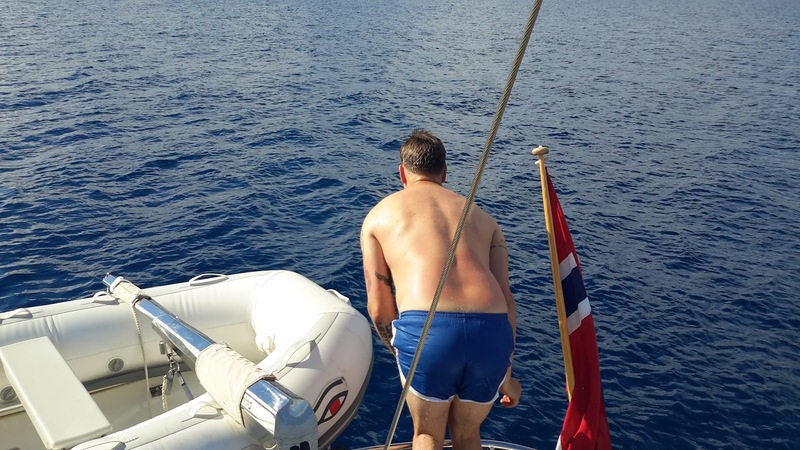 After we had fixed our mooring we could enjoy the view of several boats having some challange using their own anchor and reverse their boat in between the larger (80-100ft's) super yachts. One 50-60 feet motorboat really had a challange since they hooked in to one of the superyachts anchor and lifting their anchor from the bottom. It gave us at least 30 minutes entertining before we went for a nice dinner at the seafront. (the boat needed divers to get the two anchors apart) We all enjoyed the dinner before we went for a walk. Cavtat is a nice litle city with the most southern border checkout/checkin point to Croatia. During the evening the wind increased to strong gail, but we had a good position in the harboar and did not really noticed the wind to much. Såg herligt ut. Ser langgangen er på plass. Fint med et bilde der den er i bruk. Takk.